Eleven days ago, we were able to bid £170,000 that it took to buy the church because of the generosity and support for this from around 130 people in our community (and one or two from further afield), who put in amounts from £5 to £20,000 as donations and loans – mostly in the last few days before the sale. Congratulations Ashburton – this is an almost incredible effort! Thank you. Jyles Robillard-Day: director of a group of restaurants. Penny Clark: freelance editor, writer, poet and founder of Ashburton Writers Group and events & promotions officer at South Dartmoor Sixth Form. We hope that everyone else who put themselves forward, and many more people who want to be more than emails on a mailing list will join our Ashburton Arts Advisory Group. This will probably take the form of an email group with meetings from time to time as needed. If that’s you, please email me and let me know. If you have specific experience or skills that are relevant, let me know those. As we go on, we’ll also be forming specific sub-groups around: arts policy & booking; community engagement & volunteers; fund raising; business plan & legals; building plans/planning/design; marketing & PR – perhaps others in future. We’re still actively raising funds. Donations at any time are welcome (to the Ashburton Post Office, online transfers to 08-92-80; 04405494, or via our Crowdfunding site). We’ll be applying for grants, and doing various fund-raising events to get the funds together to take us to the next stage. Meanwhile, the latest business in town to offer its direct support is No. 14 which is celebrating its 10th anniversary this week. Starting today, for the rest of the week, *50p from every non-alcoholic drink sold will go to Ashburton Arts! * The same will go to Ashburton Refugee Support. Thank you to everyone at No. 14. Thanks also to Silver Lion Jewellers, to E & JW Glendinning, Gnash Comics and Ashburton Post Office for their very generous help. Please support them all. Any other local businesses who’d like to help, please do get in touch: andy@ashburtonarts.org.uk. Things may appear to go quiet for a while. We’ll soon complete the purchase of the building, and at that point opening it to the public becomes our legal responsibility – and liability! So we need to make sure that things like electrical systems and fire safety stuff is all in good order. This may take a little while, so please be patient. We are committed to getting the building into a fit shape to be open for events as soon as possible. That also means having all the relevant admin sorted out so that the various spaces are available for bookings, and that there’s someone available to look after it all. It’s going to take at least until some time in September before we are in a position to be more clear about any of this. It’s possible that there may be substantial (or expensive!) work necessary to make this happen. If you want to get involved, join our Facebook group at Facebook.com/ashburtonartsgroup. Do post any ideas you have there, and talk about things you’d like to see happen. Be aware that at the moment we’re all volunteers, so there are no staff yet to make things happen. There’s also a whole raft of refurbishments and renovations that will be needed before some things are possible. We have a twitter account @ashburtonarts – it’s just me at the moment, and not very active, but if you use twitter, do tag us there and spread the word. So we will hold a community clean up day at the church on Saturday 2nd September – all welcome! Come along and tell us what you want to see/hear/do at Ashburton Arts. 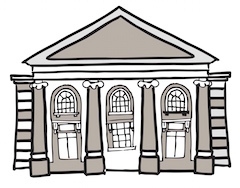 As Andy said, we have to take formal ownership of the building, and sort out some practical details over the summer, and there will be lots of planning meetings going on, and setting up the Advisory Groups, but don’t be shy – comment, ask, share and discuss with us over the coming weeks. It’s a community arts space for everyone in Ashburton and nearby. That means we are open to your ideas and we want to showcase different artforms, including visual arts, performance, music, theatre and all types of arts business. The space will be available to hire as a venue, or to work in as a freelancer, or to have a coffee and enjoy what’s on offer.